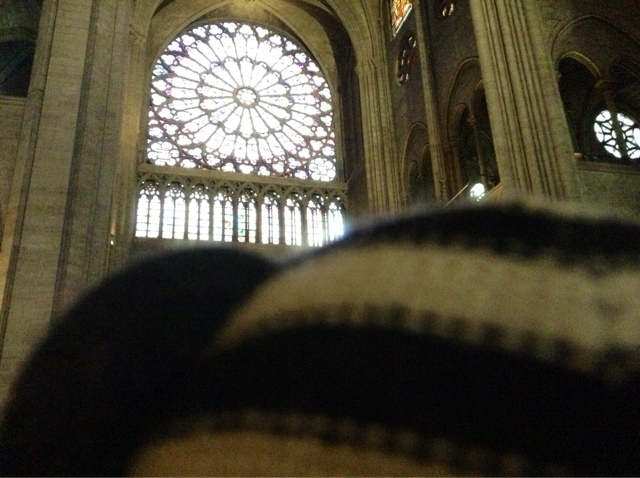 Bear has been moaning why haven't we visited Notre Dame properly what with all these day trips out of town off to Reims and Chartres? After giving it some thought I decided he had a point. Breakfast at Notre Dame requires a croissant amandes (not eaten inside the cathedral s'il vous plait). 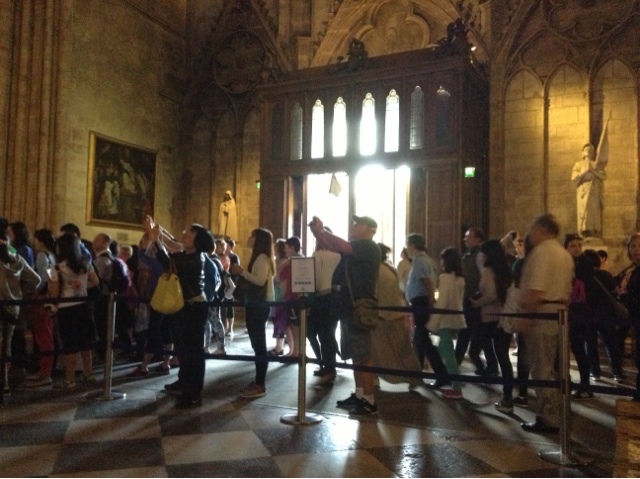 Visiting Notre Dame super early will serve you well. We left the house at 8 AM. And had the place almost to ourselves. An hour later, not so lovely. Still, when you look up, the selfies are obliterated. 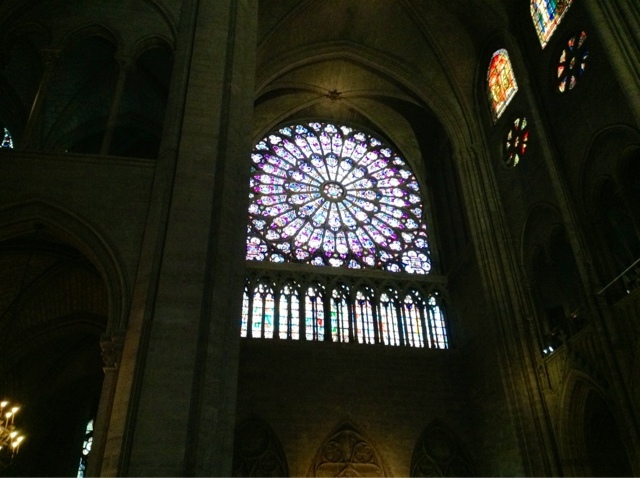 The north rose window is spectacular, the finest of Notre Dame's three rose windows. Building work began way back in the 12th century and it was not until some 300 years later construction finally came to an end. 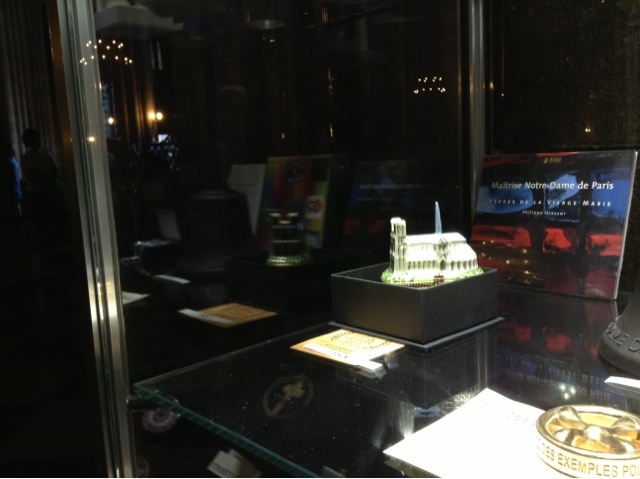 An adorable mini Notre Dame Limoge box in the gift shop. 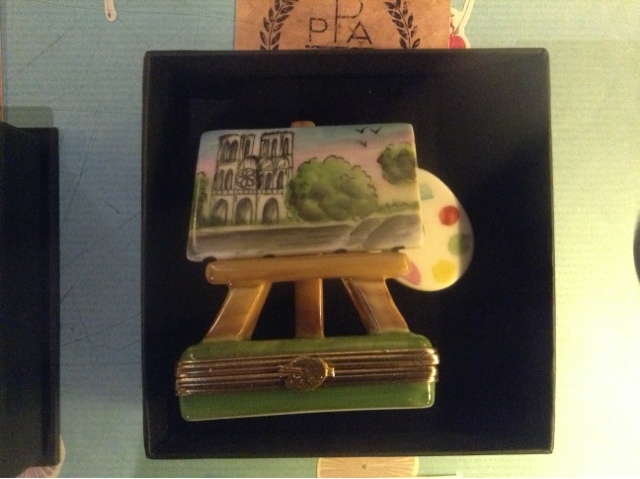 For the artistically-inclined - a mini porcelain easel and palette. Perfect for this visiting artiste sketching on the bridge. 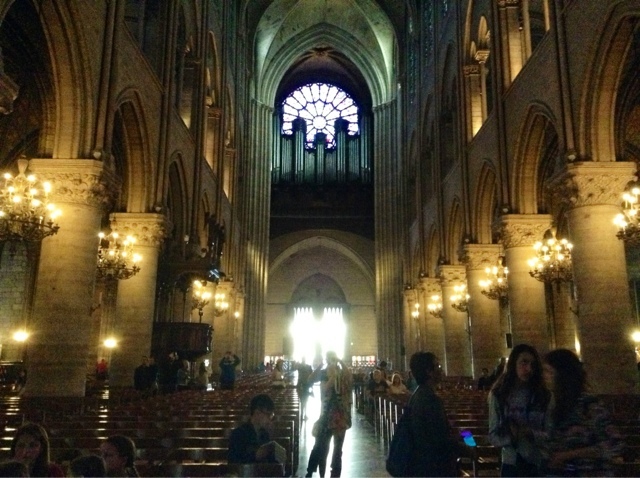 Notre Dame is completely accessible when you go early and you can avoid the crowds. If like me, you're becoming obsessed with Medieval France and Gothic architecture, this is the book. It's hard to find here in English (unless you go to Amiens evidently). 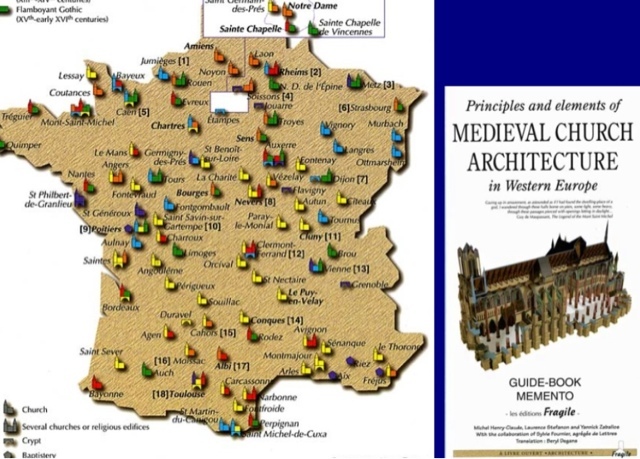 Principles and Elements of Medieval Church Architecture in Western Europe&lt; is a short(only 40 pages), yet tall book full of detailed, excellent diagrams. I'm hoping for my copy arrives soon. It was outside the door and chocked full of interesting stuff like 'A theology of light' - how architects controlled the streams of light entering the space. An amazing book. 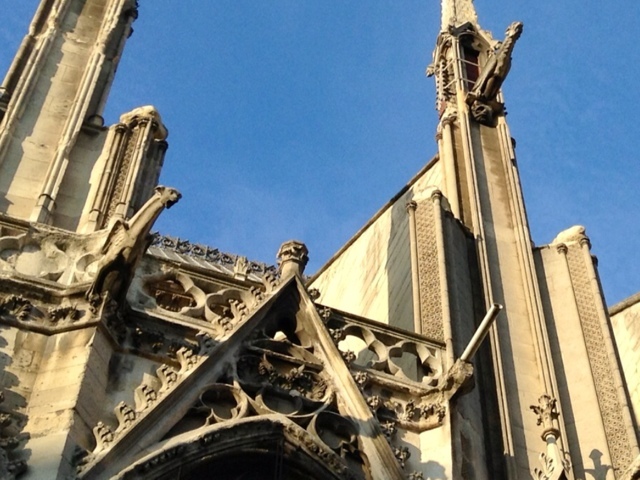 By the way did you know gargoyles, the drainage system that line Notre Dame's roof, got their name because of the gargling noise made by the water draining. 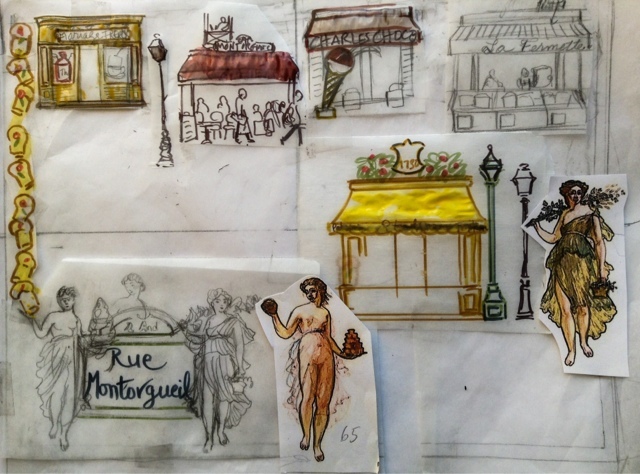 On to my work-in-progress, the Paris Map drawing for rue Montorgueil. 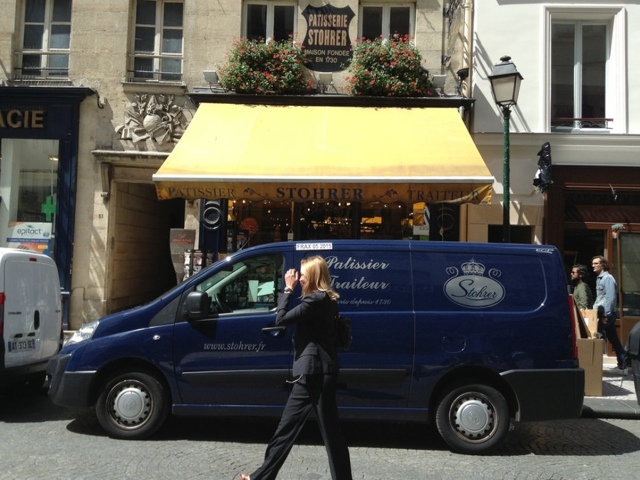 Maison Stohrer (founded in 1730) at No. 51 is la creme de la cream of the street and the centerpiece of my next map. 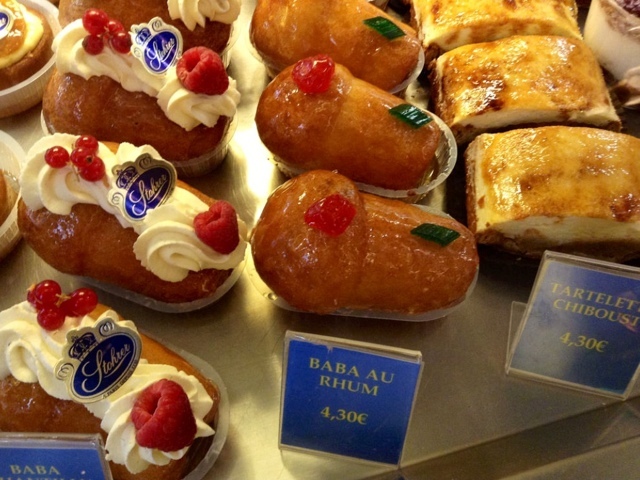 Stohrer invented the heavenly baba au rhum. I had to munch down a few to find the inner essence of the street. I've included in the map: Charles Chocolat, La Fermette fromagerie, Cafe Montorgueil and Mariage Freres (a newcomer but it's a lovely shade of yellow like Stohrer). 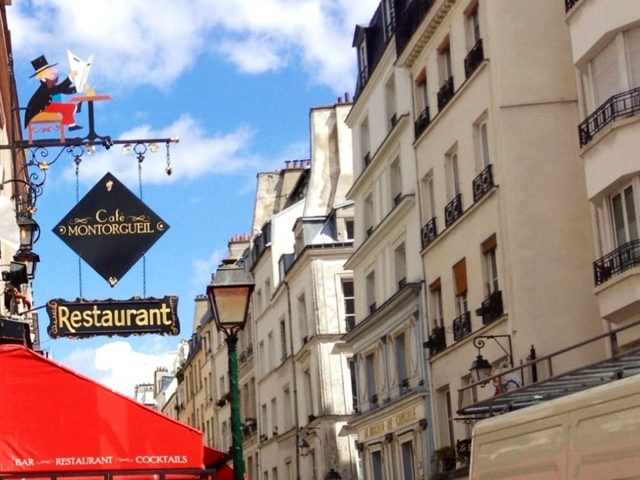 Do you have some favorite places on rue Montorgueil to share? THat croissant would be a choice of mine..almonds..oh so good..
Love the little easel box of course.. Your art is always so charming Carol. So funny...I never used to like them purely on principle. The idea they are day-old croissants that didn't sell, squashed and filled with almond paste and rebaked with more sugared almonds on top. REALLY??? That's how almond croissants are made?? 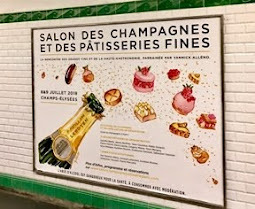 That is GENIUS: just goes to show how the French uniquely combine gastronomy with thrift and come up with something even more delicious…that out of day-old left overs they conjure up almond croissants….I am in awe. How wonderful to know you can find a time to visit when it's not crowded! And the almond croissant recommendation will be tightly adhered to! Post-almond croissant my jeans are 'tightly-adhering' for sure! Did you buy that croissant from a street vendor or shop? SVP tell, we will be there in November. 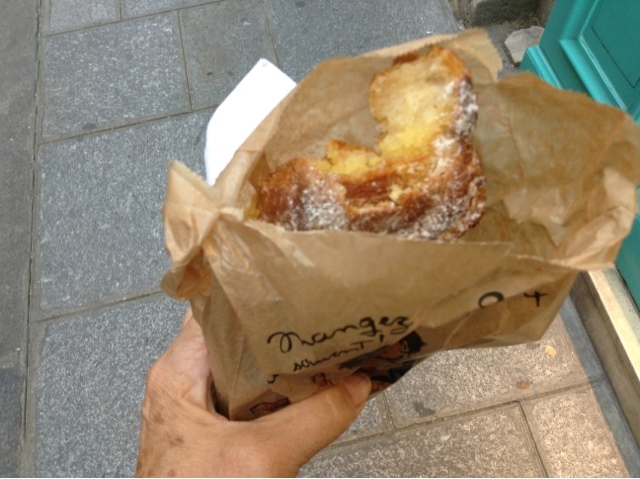 There's a nice old-fashioned boulangerie Martin on 40 rue Saint-Louie en l'Ile near the pricy cheese shop. The chef was minding the store and so much nicer than the usual meany sales ladies. Another very good reason to go early. Their chausson au pomme are delish too. tag did you? It must cost a fortune! The Chartres tea pot was strictly window décor Wendy. Carol, I nominate L'Escargot Montorgueil at #38, for your next Paris Map drawing. The facade is fabulous, topped with a large golden escargot! I love l'escargot and it is already included. Carol, You are a very bad influence on me! I had to buy a copy of the Medieval Church Architecture book on your recommendation. It will be handy for my frequent visits to the Continent! And you've inspired me to finally go to Reims when I'm in France in October. Great news about the special TGV! All Very good choices Marie. Not to worry. And I'll write more about the book..I'm very excited about it. 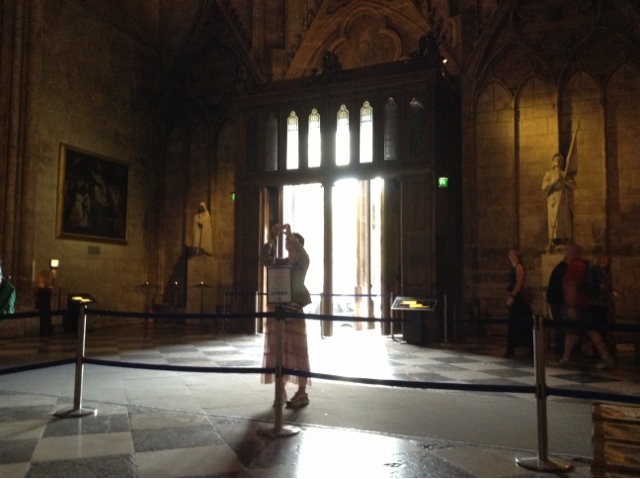 You must have lunch at Cafe du Palais very close to the cathedral nd full of Champagne ephemera. The produce and fish markets are so colorful on rue Montorgueil, if there is room on the map. 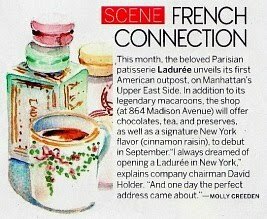 Good to know there is a new Mariage Freres! What a wonderful street. Carol, I love the pace of this post. 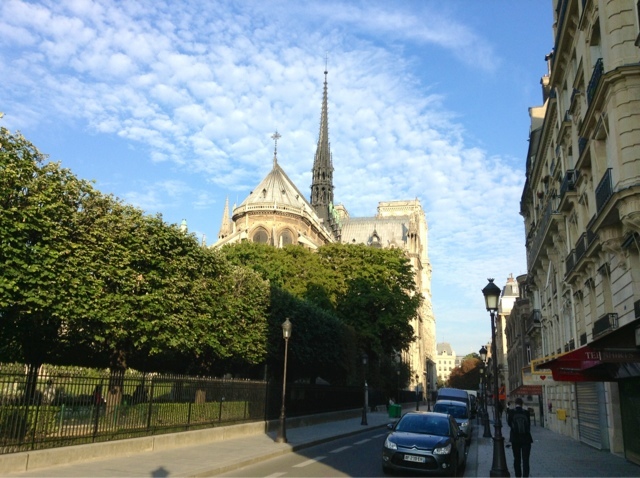 To arise early on a clear day and stroll over to Notre Dame, having a relaxed almond croissant along the way. To be able to commune with the space withing the church in a tranquil time. Ahhh. Your photographs of the fellow painting on the bridge was lovely, too. Your descriptions of the windows and architecture in this and the prior posts has taken me back to some early art history classes. Nice memories, and I am glad to have seen some of the great churches myself. What a charming response Frances! 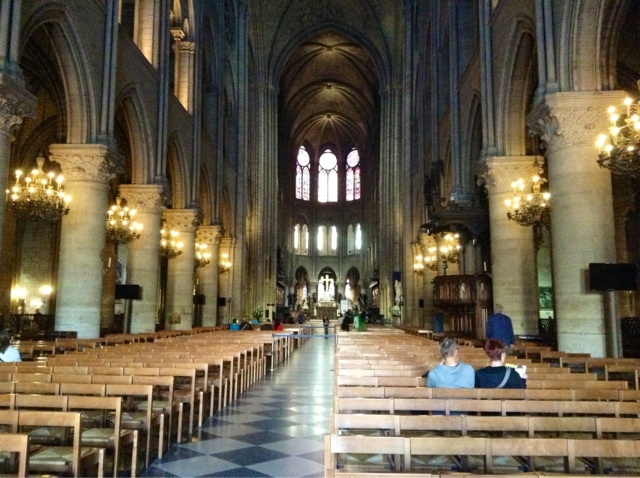 Yes these churches bring back memories of my 1st trip to Europe at age 18. I don't know what took me so long to pick up the baton again but it sure is fun! Cafe du Centre was our "go to" cafe in the mornings when my daughter and I rented an apt just off rue Montorgueil for a month in 2013. We bought our fruits and veggies at Palais du Fruits and our roast chickens at the Boucherie Montorgueil. 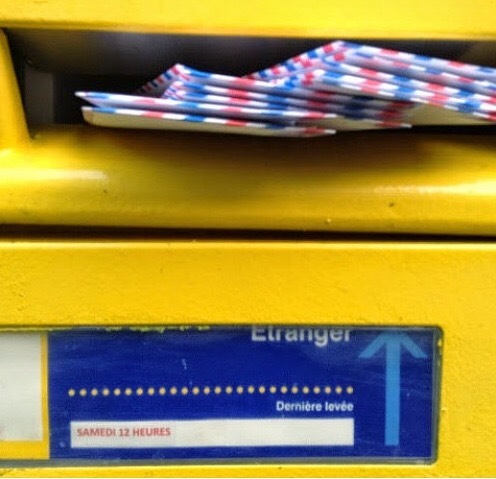 They were on the list but there's enough on rue M to keep me very busy!! I think you are on to something marvelous. 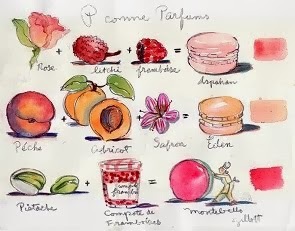 Love your maps with winsome* watercolored streets....but your pastries aren't bad...either! 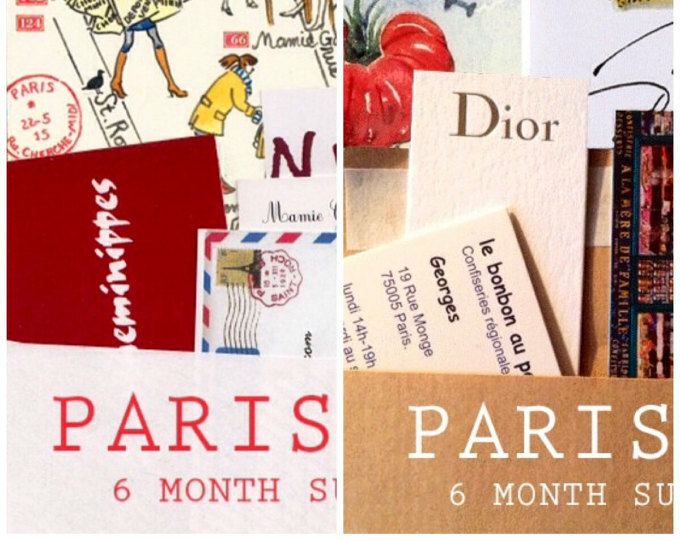 Love your blog...my favorite place on rue montogreuil is Storer and Jeff de Bruge. Hope they will be on the map you are doing! Now this was a trip down memory lane for me. Two of my favourite things: architecture and pastries. Doesn't get much better than that. Thanks for sharing the lovely photos. Thanks I will check it out today...need another shot. I did briefly think of asking him to PLEASE pull up his pants so I can steal a shot of him, but when yr shooting 'by the seat of your pants' the way I do (no pun intended) you gotta shoot and run. First time I've seen someone seriously painting full out with all his gear like that. 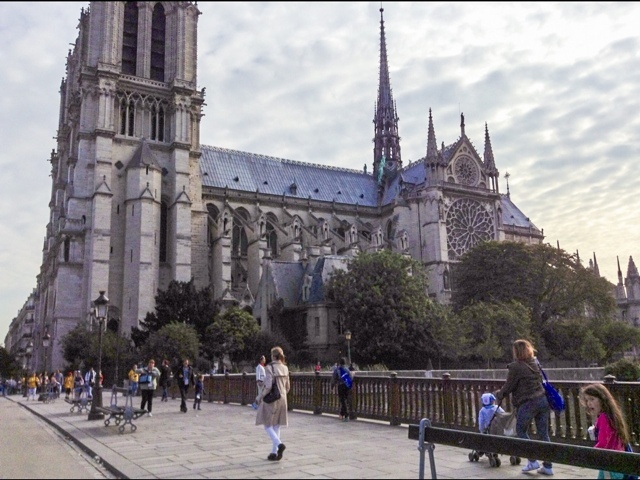 A few years ago we rented a flat on Rue Chanoisse and walked to Notre Dame every morning. It was a wonderful way to begin a day. Just behind is the Deportation Museum which brought a tear to my eye whenever I'd visit. And across the bridge is Shakespeare and Company which was always a relaxing way to end the day. I do so miss George Whitman. 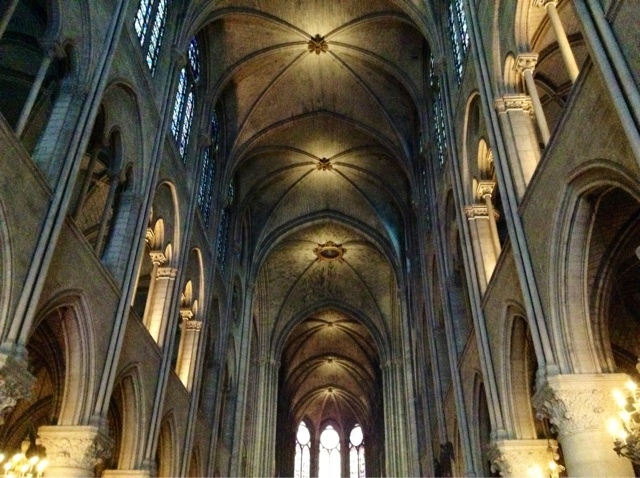 I love Notre Dame! You captured it beautifully (thanks to Bear from getting you there!). 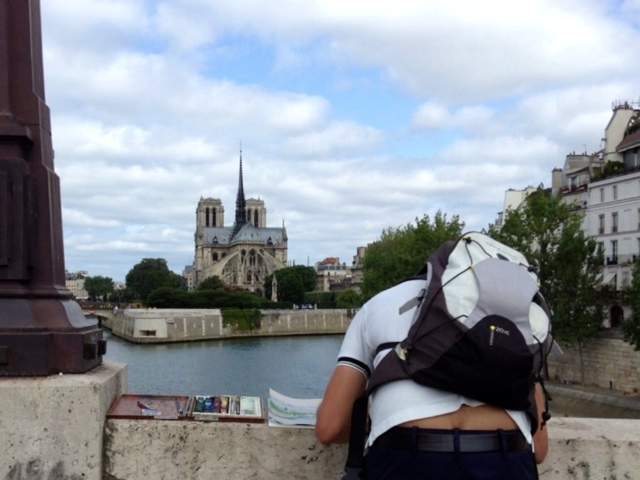 Your photo of the artist on the bridge sketching makes Notre Dame's exterior seem so much more beautiful that the interior! I just found out they are called 'Rose' windows because of the petal-like design!! Oh the interior is pretty magnificent. I love the profiteroles at La Perla (an Italian restaurant)...I compare all others to these!!! love the fact about the gargoyles, I always wondered where they got their name. 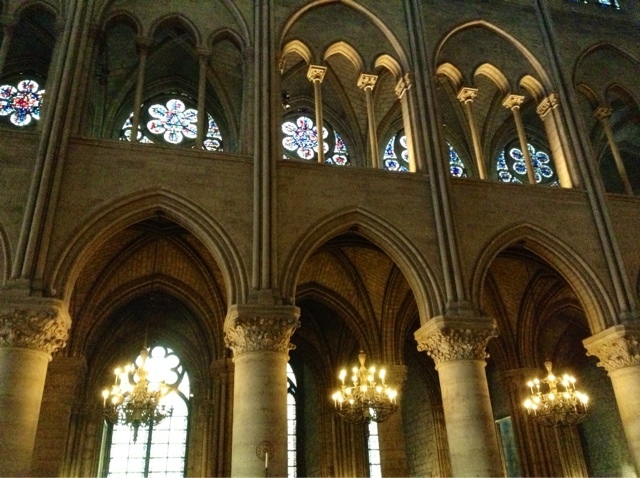 Notre Dame is probably my favorite place in Paris. I am planning a trip at the end of September and have been searching through your blogs for things that have happened in September. You are a wealth of information for every show, fair, market etc that is happening. Thanks for all the info, I really enjoy everything you and bear write about. And thanks for all your stories!! I love your blog and your paintings too!